TL;DR: Regarding some blunders at Indian Science Congress 2015. And some thoughts on if Indians really discovered Pythagorean Theorem. We need to discuss the latter part; yes! I woke up, like any other sane individual, woke up startled yesterday. At first it looked like a pun story, and I was confused whether somebody has mistakenly made the news from a funny, unreal article written somewhere else (trust me, it happens; the latest one is when People channel hosted a half an hour discussion on the news – that never was – that Zuckerberg forbade Facebook employees from using their own product at their office. In fact, this was a funny article ToI published, which People’s reporter took seriously and conducted a panel discussion on that! Given all such incidents, I cannot be blamed if I doubted whether the startling news was true or not! The news said, at Indian Science Congress, some scientists claimed that Indians invented aeroplane 7000 years ago (Maharishi Bharadwaj was the architect and it was used even for the inter-planetary travels. Poor Nolan!). Glad they didn’t say King Ravana was the first pilot ever. Things got a tad hard from there. 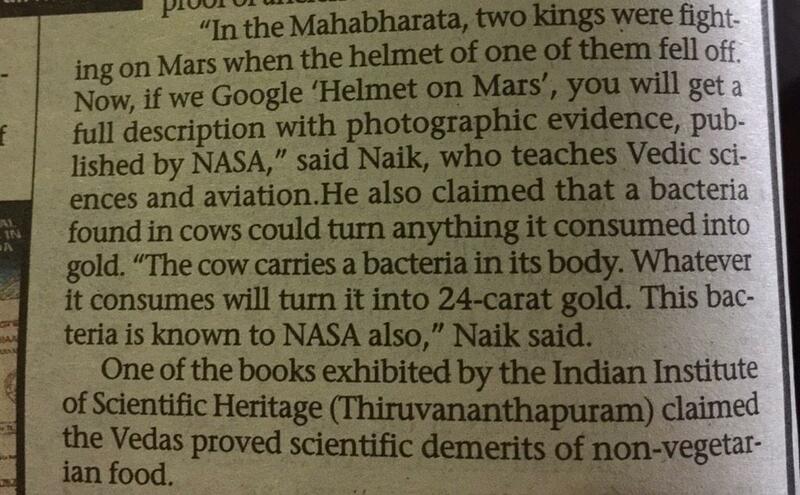 The famous Helmet on Mars is from Mahabharata age, the scientists say. The kings travelled from Earth to Moon and then to Mars, where one of them lost his helmet which’s the Helmet on Mars. 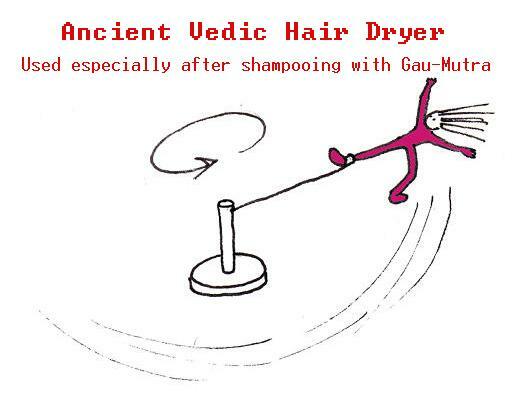 If Veda Vyasa is alive (he is, as per Hindu mythology, a Chiranjivi), he would just kill himself! I laughed to the core when I read about the 24 ct gold which was extracted from cow dung. Alas, we sold all our cows ten years back. I stopped laughing. It had started to ache my tummy. But then I stumbled upon another piece of news on Pythagorean Theorem. Someone at ISC claimed that though it is attributed to Greece, it was first discussed and contributed to by Indians. World media, including WashintonPost reported the hilarious proceedings of ISC, looking at which I really felt ashamed of the whole thing. What would people think of us, Indians, if the world gets to read this story: http://www.washingtonpost.com/blogs/worldviews/wp/2015/01/04/indians-invented-planes-7000-years-ago-and-other-startling-claims-at-the-science-congress/. As the saying goes, one bad apple spoils the bunch. People will normally laugh at the Pythagorean theorem stuff too. They can’t be blamed. There have been immense writings on Indian Mathematics and our contributions being attributed to the Europeans. Unfortunately, many tend to claim these without proofs (read about some of such things here: http://malayalam.usvishakh.net/blog/archives/category/indian-mathematics). However, there are contributions which are genuinely made by Indians, and are attributed to the foreigners. But when there are false claims, the whole bunch stinks. A couple of months back, I stumbled upon a book titled “അനന്തതയിലേക്ക് ഒരു പാത” (A Passage to Infinity) by George Gheverghese Joseph. It came to my knowledge later that he is one of the leading scientists whose research area is Contribution of Indian Mathematicians. The book was an interesting read, and I ended up ordering an English copy of the same from Amazon. Let’s discuss some excerpts from this book. 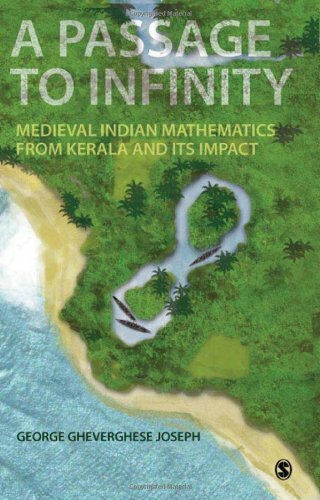 The possibility of independent European discovery of some of the Kerala Mathematics is always there, although the choice of that as a default solution by most historians is debatable. Indeed without documentary evidence in the form of direct translations of Indian texts, or direct acknowledgement of Indian sources for these discoveries, the legal criterion carries a crucial weakness when it is extended to apply to the context of establishing scientific and mathematical discoveries. … the similarity in the discoveries made need not necessarily imply influence – it may simply be the outcome of the independent discoveries of the best description of the world or best way of solving a problem. ….. For example, many cultures have independently discovered the right-angle theorem attributed to Pythagoras in the West, but this is not the outcome of diffusion of knowledge but objective states of affairs. They were independent discoveries that yielded the same knowledge needed for constructing buildings in all cultures. If you read the last line in the above paragraph, that reiterates the importance of right-angle theorem in construction of buildings. That says a lot. He also states that one of the Shulba Sutras by Baudhyana establishes the concept of right-angled triangles and the relation between their sides long back in BC 800. Aryabhata talks about this in his Āryabhaṭīya, whose 17th stanza starts with this knowledge. We knew it – From Gurukulam! The authors submit that the the right-angle theorem is wrongly attributed to Pythagoras (570-495 BC). Wikipedia says, “The Pythagorean Theorem was known long before Pythagoras”. 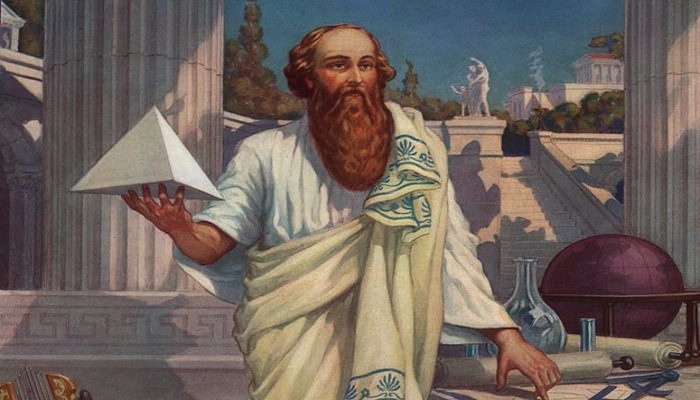 There is dispute between who proved it first – Pythagoras or Euclid? Humans knew about the Pythagorean triplets well before Pythagoras. It’s said that the Egypt used this knowledge in the construction of pyramids (recall what A Passage to Infinity said above). However, it was Baudhayana, an Indian who talked about the right-angle theorem. 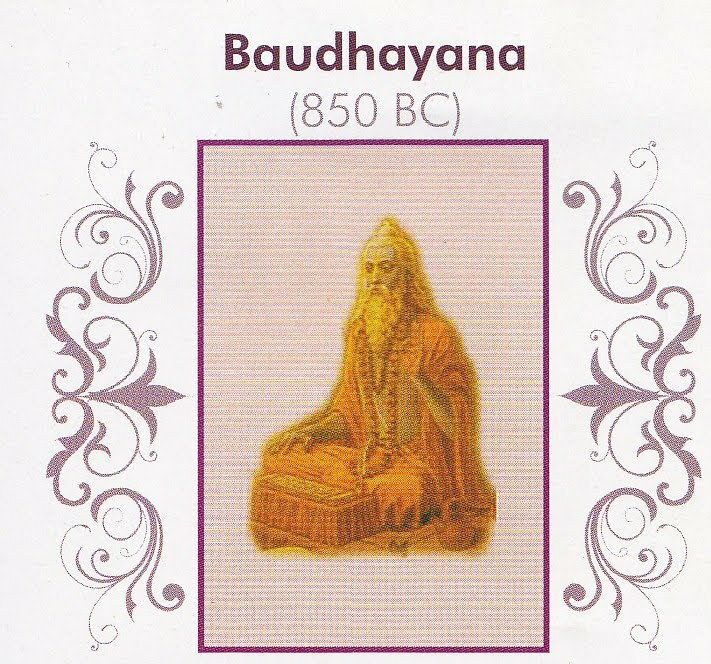 Read about it here: https://mysteriesexplored.wordpress.com/2011/08/31/baudhayana-pythagoras-theorem-world-guru-of-mathematics-part-8. He lived in the ~800 BC century (which was at least two centuries before Pythagoras was born!). They why is it attributed to someone else? If you draw a square with the diagonal of another square as its side, then the area of the former will be the double that of the latter. (Further, this applies to right-angled triangle too). If you add the areas of two squares made of sides equivalent to the length and breadth of a rectangle, then it will be equal to the area of a square made with the diagonal of the rectangle as its side. Read the last line above. Don’t you feel that it is the theorem we are talking about? This is from Apastamba Shulba Sutra, a book by Baudhayana. Disclaimer: I’m an amateur, math lover. Errors could be there in observations.